I’m particularly keen to share this beautiful wooden house with you because I think you will love both the plywood interior and the clothes by French Fashion Designer Aurélie Lecuyer. Aurélie’s home also gathers three things that we all love a lot here: Interiors, Architecture and Fashion. Her beautiful wooden house was conceived by Architect Thomas Walter from Atelier Ordinaire who specialised in wooden houses with plywood interior walls. What exudes from this inspiring plywood interior is a timeless simplicity. Like this garage converted into a Summer house, plywood walls have been left raw to maintain the feeling of a “cabane” (i.e. hut). While decorative items like this Lappalainen brass mobile have been kept to a minimum. I got mine from Tea and Kate, an independent shop I highly recommend. They have a very beautiful and well-curated collection of goods for your home (and we owe to support and purchase from small businesses if we want them to survive). In the lounge, a brown Ligne Roset sofa, beige curtains and a vintage school chair complement the light grey of the concrete floor and the walls. A soft palette of browns & beiges that contributes to creating a sense of calm and peace in the room. If you’re after a vintage TOGO leather sofa like the one above, this website has a great selection. In the bedroom, plywood walls have been left bare. While a large window like the one we had in our home in London, provides a changing scenery day in, day out. I feel it’s the perfect room to unwind, don’t you think? After all, what else do we need to relax? A comfortable mattress for a great night’s sleep and some soft stonewashed linen sheets that make you feel good each time you are in bed. Outside, the house is covered with burnt cladding giving this wooden house a very unique, striking look. Wood is, of course, used indoor and outdoor. There is also an obvious choice to let as much natural light as possible coming in. 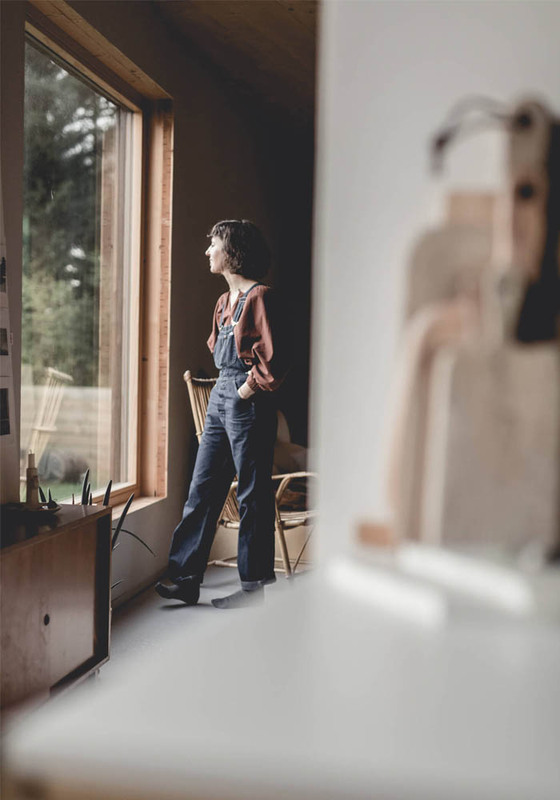 Like the wooden house she envisions, Aurélie Lecuyer is creating a fashion brand with a sustainable approach. To break free from the over-consumption and waste that fashion encourages, Aurélie Lecuyer aims to create a timeless collection. Fashion basics that you will enjoy wearing days in days out. Colours that will recall those of the land and the ocean. Clothes made from sustainable materials that will last a few years. Have you enjoyed this article!? I’m hoping you have. I would love to hear your thoughts. Also, whether you would like to hear more about French fashion or French interiors. In the meantime, you can follow me on Bloglovin’ or sign up to my E-news to be updated on the latest blog posts. Quelle belle maison!! J’adore la simplicité et la beauté des matériaux! Ça laisse toute la place à la beauté de l’environnement. Moins de bruit pour les yeux et l’esprit! Bonne journée Karine! wow what a peaceful feeling the wood gives me! like you’ve brought a little bit of the organic into the home. thank you for sharing!